Happy Birthday to the guy who wrote the episode that turned me on to The Office in the first place! Article: Sitcoms circle the wagons. Analysis of some of the fall’s returning comedies, including The Office. 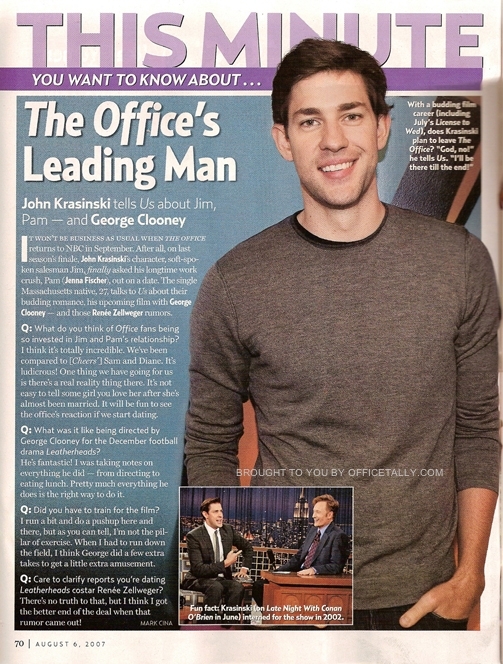 Article: The Office’s Leading Man — John Krasinski. Article: ‘Simpsons’ creators pick perfect time to sent Springfield sillies to big screen. Includes some interesting quotes from The Office Executive Producer Greg Daniels. Chat: Rainn Wilson chats online with Tom O’Neil of the Gold Derby Forums on Tuesday, July 31. Jenna is lining up to do a chat, too! Graphic: who is that, endorsing the Denver Post Underground Music Showcase? Fan story: a fan meets David Denman and Jenna Fischer! Photo: a yearbook picture of John Krasinski. Video: a trailer for Horton Hears a Who, starring Steve Carell. Video: a trailer for The Comebacks, co-starring David Koechner (“Todd Packer”) and Melora Hardin (“Jan”). Video: a trailer for Dragon Wars, co-starring Craig Robinson (“Darryl”). OT subscription options: I’ve updated the OT Subscription page to include a comments feed and instructions on how to follow OT at Twitter. Rhythmdev’s updated their wallpaper collection to include Ryan and Creed! Previous wallpapers after the jump. With this being one of the slowest Office news weeks ever, I had some free time to play around with Twitter. Twitter lets you send short messages to “followers,” who can choose to receive your messages via IM or cell phone text messages. I post a Twitter whenever I update OfficeTally. You can see what they look like in the OT sidebar. 1) Log in or create an account at Twitter. 2) Go to the OfficeTally Twitter page. 3) Click the Follow button. I heard that the first four episodes are the one-hour episodes. That is correct, and they will air back-to-back. Starting Sept. 29, our first hour will air, and then the following Thursdays our other three hours will air. Jenna Fischer on That 70s Show, “Don’t Lie to Me,” FX. Angela Kinsey on Monk, “Mr. Monk and the Naked Man,” USA. PREMIERE! Nancy Walls on Becker, “Thank You for Not Smoking,” CW. Kate Flannery on Bernie Mac, “Stiff Upper Lip,” FOX. I’ll be giving away a Dwight Bobblehead Pin (courtesy NBC Office Store) sometime today. I will post a trivia question and open this post to comments at some undisclosed time — simply be the first person to add a comment with the correct answer to the question, and you win! SPELLING COUNTS. Remember to include a valid email address. Sorry, U.S. residents only. 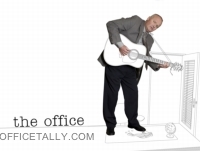 In one of Creed’s recent blogs at NBC.com, what food did people cook on the bus floor?